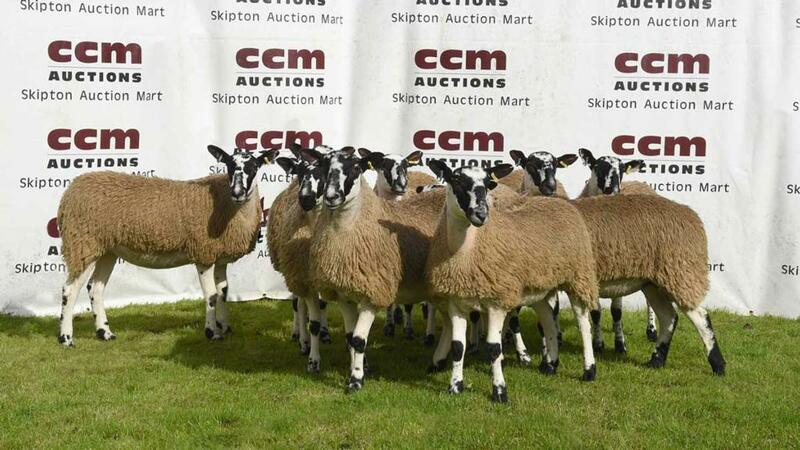 The North of England Mule Sheep Association (NEMSA) chairman Kevin Wilson, Blubberhouses, took the top title at Skipton’s opening gimmer lamb sale for the first time. The champion pen from Kevin Wilson and family, Blubberhouses, which sold for £270/head. His championship pen of 10 led the trade at £270/head, six of which were by the Wilson families F1 Bighead ram, shared in partnership with his Richmondshire breeder Alan Busby, and the remainder by Bighead’s home-bred sons. The buyers were the Haynes family, Winslow, Buckinghamshire. At £162/head were the fourth prize winners in the pen of 10s from Francis and James Caton, Otley. This was followed at £160/head for a pen from the Kitching family, Threshfield. At £155/head were a pen from John and Claire Mason, Embsay, with a further two at £150/head from Janet and James Huck, Austwick, and Stephen, Tracy and daughter Samantha Fawcett respectively. Next were the third place pen in the 10s at £145/head from the Kitching family, Threshfield, followed at £142/head for a consignment from the Walker family, Dunsop Bridge. At £140/head were the reserve champion pen of 10 from David and Robin Booth, Feizor, Settle, followed at £138/head twice for a pen from the Wilson family, followed by a lot from Robert Crisp, Calton, to the same money. Selling for £135/head twice were the champion and reserve pens of 20 from the Booth family and Ashley and Rachael Caton, Otterburn, respectively. Averages – Lambs, £91.22 (down £6.87 on the year).